Advanced Water Group (AWG™) is an Australian company that developed the AWG™ Wastewater Treatment System (WWTS) and is affiliated with Desal Systems. The AWG™ WWTS is an innovative, patented treatment process that uses an innovative physical and chemical coagulant separation treatment process rather than a biological degradation. The AWG™ WWTS process is proven, effective, technically simple, modular, pre-designed and economical — and meets municipal, new housing development and resort requirements head-on with very low levels of nutrients in the effluent. At the start of the AWG™ WWTS process, an automatic belt filter of a Preliminary Separator removes up to 70% of the filterable biomass by gravity filtration resulting in the filtrate being equivalent to the requirements for primary treated wastewater. The Preliminary Separator also receives the returned contaminated backwash water from rest of the process. The solids on the filter belt are blown into the hopper of an auger press that compacts and mechanically dewaters the solids to form 30-35% dry cake that is discharged into a bin, ready for reuse or disposal. The filtrate stored in an equalization tank is pumped to the top of the first Continuous Backwash Upflow Media (CBUM) filtration tank where a liquid poly-aluminium chloride (PACl), is injected just upstream of the tank. The polymer creates a semi-permeable gel-barrier to trap fine suspended solid particles. Phosphorus (TP), as well as copper, zinc, iron, arsenic and heavy metal ions are also removed to a low level by their natural attraction and tendency to bind with the polymer. An airlift pump lifts the contaminated media and polymer to the top of the tank where it is washed and separated in the specially designed media washer without interrupting the filtration process. A second CBUM filtration tank is used as a polishing filter for the effluent from the first CBUM tank. This tank is shorter than the first CBUM tank so influent enters and exits the tanks by gravity flow. The polymer coagulant is added in the same manner and the continuous backwash upflow process operates in the same manner as the first CBUM filtration tank. The high quality effluent with a suitable level of disinfection is ready for recycling, irrigation reuse or release to the environment in line with regulatory guidelines. The compact, modular, prefabricated AWG™ WWTS has the ability to significantly reduce the construction time and capital cost when compared to a conventional WWTS. It reduces the construction of major civil works and minimizes project delays caused by inclement weather delays and long commissioning times. Each AWG™ WWTS can operate continuously at anywhere between 30% and 110% of the design capacity without compromising treated effluent quality. For lower influent flows, the system will automatically shutdown and enter a standby mode until there is sufficient primary level treated sewage (as determined by level sensors) to commence treatment again. The system automatically monitors the turbidity in the treated effluent and will return effluent for further treatment, if necessary, until the PLC determines that the turbidity has been reduced below a maximum set value. The system may be remotely started and stopped as operational considerations dictate. Because of its small footprint the AWG™ WWTS can be used to extend the capacity or life of existing treatment systems without major capital expense. On greenfield sites the expansion of treatment capacity is accomplished, as needed, by adding extra modular treatment trains provides the most cost effective upgrade option available. Very low power consumption only requiring small pumps and blowers provides a low OPEX, i.e. 1 ML/D AWG™ plant requires <5 KW. Opex rates for the WWTS are approx 50% of typical SBR/MBR/IDEA plants. Low power consumption allows solar power to effectively offset a large portion of power used. Because of offsite fabrication, time dependent projects can be completed quickly compared to other technologies. Reduced OH&S issues, as all main plant and equipment are designed to be easily accessible. Total Suspended Solids (TSS) typically <3 mg/l, and <10 mg/l at all times. Turbidity typically <2 NTU, 5 NTU <5% of time over 24 hours and <10 NTU at all times. 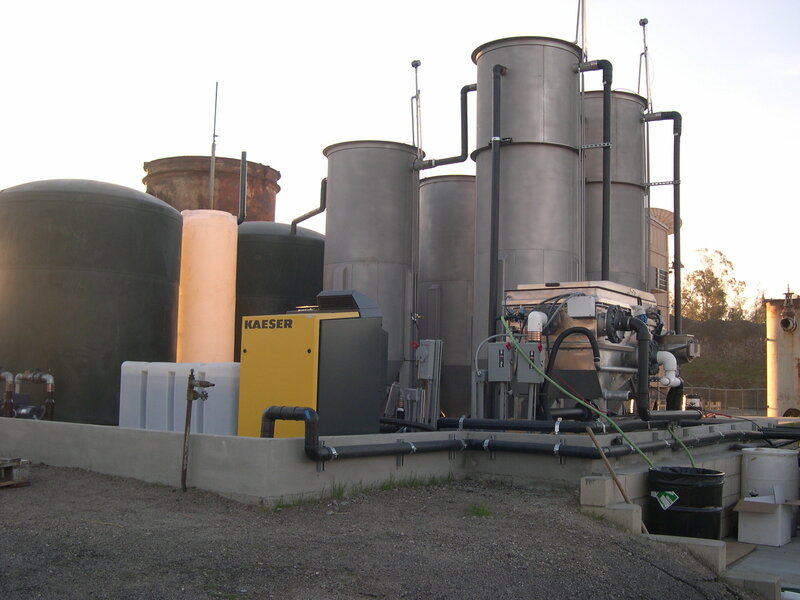 Available predesigned post-treatment systems assures that effluent quality will meet the discharge licence conditions with the ability to upgrade/improve this in the future if required. The system is designed for unmanned operation with full remote monitoring and control. The major WWTS assets are designed for a 50+ year life and will never become stranded as the system is modular, and can be easily relocated to another site. The AWG™ WWTS components are manufactured offsite in quality assured facilities which ensures a higher standard of quality control for the project. The AWG™ WWTS represents a proven, successful, fundamental change in design and operational philosophy of small to medium scale WWTP’s that has the ability to effectively arrest the current rate of decline of the health of our waterways and receiving environments. The AWG™ WWTS is a modular, economical and environmentally friendly method of creating high quality reusable water that demands significantly less treatment space, while reducing greenhouse gas (GHG) emissions.